If you haven’t already discovered Ticketmaster’s cheap deal site, make sure you head on over there today to bag yourself a ticket deal or two. tmdeals features lots of different events – from comedy shows to concerts – and can save you up to 50% on ticket prices. Our favourite at the moment is their Shrek deal, with tickets available from just £10! 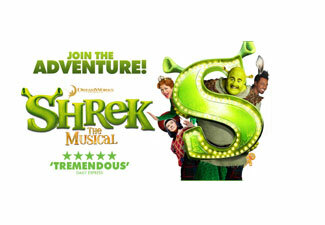 Currently starring Dean Chisnall as Shrek and ex-Hollyoaks actress, Carly Stenson as Princess Fiona, this is a great musical for all the family, full of fun, frolics and great songs. Tickets are available on this deal up until 12 October. Terms and conditions mean that tickets are only available for performances that are up to two weeks after the booking date.